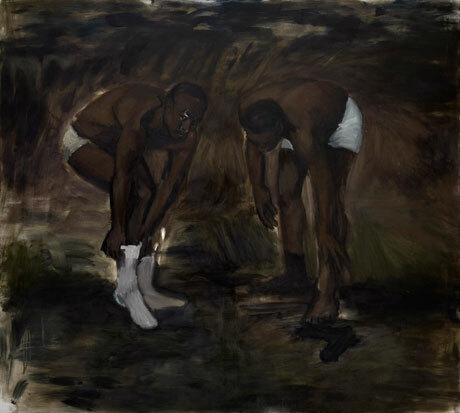 The recently announced shortlist for Tate Britain’s 2013 Turner Prize includes painter Lynette Yiadom-Boakye (London, b. 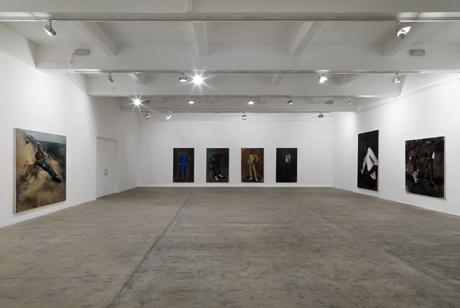 1977), who readers may recall was the only painter included in the New Museum’s 2012 Triennial “The Ungovernables.” Turner Prize jurors select specific exhibitions, and Yiadom-Boakye was singled out for “Extracts and Verses,” a 2012 exhibition at Chisenhale Gallery. “Yiadom-Boakye’s intriguing paintings appear traditional but are in fact much more innovative,” according to the Tate’s press release.”Her portraits of imaginary people use invented pre-histories and raise pertinent questions about how we read pictures in general, particularly with regard to black subjects. ” In NYC she is represented by Jack Shainman, where she had a solo in 2012. 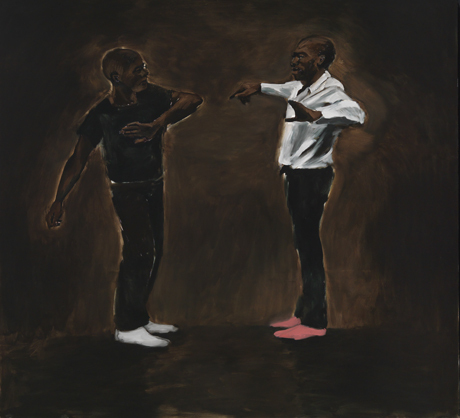 Lynette Yiadom-Boakye, Milk For A Maestro, 2012. Commissioned by Chisenhale Gallery. Photo: Marcus Leith. In the following conversation, exhibition organizer Jamie Stevens and Yiadom-Boakye discuss the fictitious characters and enigmatic narratives in the exhibition at Chisenhale. with regards to both the exhibition and the individual works? I see the paintings as paragraphs or sentences. I don’t want to fix a particular narrative behind the work but to instead leave behind a suggestion of one. I chose Extracts and Verses because I like this idea of each work being a snippet or a portion of something else, alluding to poetry but not providing the whole poem. JS: Looking at your paintings, I find that small details become the seeds for how I might begin to project some kind of narrative on to the image. Is that way of reading the work something that you want to foster? LY-B: It is never direct for me with the titles of the paintings. I derive titles often from something so far removed from the image, or so arbitrary, that it’s more about the fact that I like words and I like images but I don’t necessarily know how to put them together. JS: So they don’t necessarily correlate? Could all the titles of the works potentially be transferred to different paintings within the space? LY-B: No, there is a link each time but I’m just not sure how useful that link is to anybody else. I’ve made an association whilst making the painting, so the title is specific but the narrative link is usually about a particular feeling or atmosphere in the work that related strongly to my own associations. JS: In terms of associations, one of the most written about elements in your work is the anonymous or fictitious status of the characters. Is it important that we should know that these people aren’t real, that they haven’t sat for you? LY-B: Yes, it is important because I need the work to not be read as though these are friends of mine or family members. I’m not interested in that mode of working. I’m not really interested in people in that sense. In the past, I have had people sit for me. I had one man sit for me for many hours but I couldn’t get anything because he was there. Why try and immortalise him? I couldn’t get him on to a page or canvas without it becoming all about that specific person. I want to think about painting, not the personality of the man sitting with me. I’m far more interested in how we can make people intelligible through paint, rather than getting bogged down in characters. I’m not interested in the personalities of specific people I know. I want the work to be pulled out of the air somehow, to play God and exploit that power of creation in paint. JS: The work is very affirmative in that way. There does seem to be quite a claim for painting in your work, in terms of how ideas can become material. LY-B: Exactly, the work is about translating paint into people. JS: The thing that you are saying you definitely don’t want, the question about are these paintings of friends and family, that somehow does get to the crux of an issue which is relevant to the work. Having an African name and being a black artist, do you feel like you have to push against an idea that you must always be representing those things somehow? LY-B: People always assume that the work is very personal in that way and I suppose that’s understandable but I’m not sure the same would necessarily be assumed of a white artist, that the work is highly personal, perhaps even family or self-portraits. My work is of course personal but only via the medium and in how I’m trying to feel that medium. The visual and the felt is what I think is important. Intuition and the process of following a train of thought that might not give itself over to explanation is where my work becomes personal. The idea that my work alludes to a cultural background is complicated because I feel like there is a question there of normalising something, picking up on the fact that the people in the paintings are dark skinned or black. Black isn’t other for me, it would be odd if the people in the paintings were white. It’s not about the fact that they’re all black. A lot of the features and hair is interchangeable anyway, the figures are coloured dark but the features could belong to anyone really. It is of course important that the figures are black but that stopped being a starting point for me a very long time ago. Sometimes there are white figures in my paintings too and that is equally normal. Maybe it’s tokenism! JS: The work definitely addresses that tension, perhaps even in how the work overwrites such questions. LY-B: Yes, I want the work to address that. When I say that these readings aren’t an issue for me in the same way, I don’t mean that it’s not relevant to what I do because it definitely is. I want that question to be an aspect of the work. It’s just that a lot of the decisions in the work ceased to be self-conscious for me a long time ago. It’s just one aspect of painting the figure that will remain consistent in my work. JS: What drives your interest in figuration and portraiture? LY-B: I’ve just always done it and I feel like it’s something I’ve kept coming back to. It’s always been my interest, something to do with figuration, people, the real. JS: To talk about the paintings present in this exhibition, one feature that has been a surprise for me is the use of colour. I had a strong sense from documentation of your work and also from studio visits that the colours in your paintings are chosen from a very precise range. But actually this exhibition slightly dissembles that idea – there are very bold departures of colour from the dominant palette present in almost every work. LY-B: Colour for me is always about problem solving. I’ve never felt confident with colour but painterly concerns are what keep me interested. The whole of my practice is about painting, trying to do it properly. To make something tangible through paint and to drag people out of the canvas, my starting point will often be a colour or very formal considerations. Those academic questions asked from the beginning of art school still sit at the heart of my work; colour, form, composition, perspective. These are the things I think about when starting a painting. Painting is so miraculously felt that I later have to suspend disbelief and rely on intuition. JS: Does your interest in the rules or principles of academic painting mean that you have work that clearly fails? LY-B: Yes, I know if the painting has gone wrong because there are a number of ways of telling by those terms. I think that other people also pick up on those problems very quickly because you know when something has been executed with confidence. I produce a lot of work and I destroy a lot of it. My terms of judgement vary from piece to piece but often it will be something very simple and formal that has gone wrong. The element that has gone wrong might be extremely subtle, if the look in someone’s eye, for example, is somewhere too far into despair for what I want then I won’t use the painting. Also, when I paint I tend to apply colour from very dark to light. If the graduation in tone is not right it becomes difficult to fix those problems and if that balance isn’t right the whole painting is thrown off. I’m an impatient person so I’m not interested in agonising over corrections. JS: And you make a lot of work – is that to do with your impatience? LY-B: I do make a lot of work. I have a strangely short attention span and each painting takes me about a day of solid work. JS: The speed and gestures latent within your paintings seem to be preserved in those works that do survive your initial judgement of whether or not the work has failed. How does that first selection process unfold? LY-B: Well when I say I don’t want to go back and fix problems, that is because a painting is built up of a stream of thoughts and it’s very hard to click back into place what I was previously thinking. I frequently miss the point in my own work if I don’t move on to the next painting. That energy or movement that you are talking about can easily get lost if I don’t continue to move forward. Really I want people to read across all the works. In any body of work there will be relationships and conversations between individual paintings. Sometimes those relationships will jar for the wrong reasons and that is another way of gauging a failure. JS: You used the phrase ‘dragging people out of the painting’ and there do seem to be real traces of physicality within the works. There are parts of the paintings that seem highly focused in their compositions but in the same canvas there can be a seemingly different status of attention or approach to how the paint is applied. LY-B: Sometimes I want the paintings to seem very finished but also there are works that feel a lot more drawn. My focus in certain works can be more about outline and movement, which is part of my interest in pose. Fiscal Playsuit, the painting with the orange background is much more drawn, the lines in it are very present. I want to capture the weight of that figure, of his emergence. He’s wearing yellow, the background is orange and the figure is almost in relief to the thing he’s part of. Different approaches to rendering emergence and having a very different feeling to each work is important. JS: You talk about reading across the works and although some works are very distinct and others very similar, there is a sense of seriality to your work. Do you feel as though all of your paintings are part of one overarching project? LY-B: In some ways, yes, I suppose so. I’m not sure how because in my head I tend to break works down into sub-headings. There tend to be a lot of paintings that are versions of previous paintings but perhaps with a slight change in the hand gesture or position of the head or a different outfit. I like the idea of evolution, of someone appearing in the same place over and over again or even with similarities in composition between paintings. I conceive of them as groups, as a unit, how they might work together. Looking, seeing and reading across them is something I really want to encourage. JS: Could you talk specifically about the hang at Chisenhale and also the process of the hang in general? At the moment there are more paintings in the corridor ready to be returned than there are in the gallery space. Is the process of deciding the final presentation pleasurable? LY-B: Often when I’m hanging a show I’m not so involved in that process but I always want to be because my way of seeing is very particular. I feel like it’s important to be involved in the hang. I have a lot of work, which means that there a lot of possible meanings available in hanging them and I’m happy with that flexibility but I also think it is a crucial stage for the work. The change in scale between paintings, for example, is very important. A figure that fills a massive space to one that maybe just sits in the centre of a canvas, to people standing, to people cropped at the waist. All of those variations do different things to each other, along with colour, form, tone. I don’t like to curate before I’ve made things so I make everything then later try to make sense of them collectively. JS: So the work that has been left in the exhibition does have a clear coherence for you? One of the common features of the paintings is that they all have male figures in them, which wasn’t planned when all of the works first arrived at the gallery. How did that pan out? LY-B: It’s funny because there was an equal amount of men and women in all the work I’ve made but like race in the paintings, it’s so interchangeable. You say they are all men but they’re not the same kind of man and they aren’t at all macho. As we hung the show I felt like I wanted to get away from the idea of having to have men and women, of having to somehow represent a community. JS: There is definitely a lot of variation left within the exhibition, from scenes of people interacting to individual faces with feather collars, etc. LY-B: Yes, that’s the other thing I should say: I often refer to these figures as people but they aren’t, they are composites pulled together from scrapbooks and drawings. They aren’t real men and women. JS: So whilst you render them do you develop an idea of their personalities or do they remain as composites? LY-B: They don’t have our concerns, that’s for sure. They aren’t here. The figures are almost fully liberated, I don’t concern them with the worldly. They are superhuman. It’s hard to think of the show as a room full of men. JS: It’s a particular type of fiction that you seem to propose with the paintings and, as other writers have commented, they don’t seem to suggest specific contexts. LY-B: They are non-specific. I try not to root them to a particular time or place. That’s not always true but for the most part it is. Identity can be so many things, it’s irrelevant what I say it is because I’m inventing the contexts and making all this up. JS: The elements in the painting that do feel particular tend to be the posture of the figures, where they are looking, their clothing also often seems to ground the image somehow. LY-B: Yes, directions within the paintings are important. The clothes tend to come from colour decisions. If there is an action taking place, the clothes might be very simple – it’s quite thematic – whereas if the figures are static, I might put people into a sweatsuit and the work is titled accordingly. In that instance, it’s almost a non-outfit, in some ways contemporary but it doesn’t reference a particular community or class. A lot of the time, the clothes function as uniforms when you look at them across a series of works. JS: How do you decide on the scale of your paintings? LY-B: It’s to do with how a figure fills a canvas regardless of its size. That is how the figure seems bigger or smaller, so it’s interesting how smaller works might seem bigger just because of the way a figure might sit in it. If there is an expanse of landscape, the question I confront is how big do I want the expanse to be around the figure and how does that figure emerge. The sweeping landscapes and seascapes consistently feature because I like having vanishing points. In the two larger portraits on the back wall, it’s very important that they fill the canvas, bursting out of the wall. They are really the anchor for the whole show, in terms of how they sit next to the other works. In any body of work, those figures will be there. I often start with them because there’s something about those portraits and the painting with the stripy top that represents the spirit of how I approach my work in general. Everything else can fit around them. Other finalists for the Turner Prize include filmmaker Laure Prouvost, relational aesthetician Tino Sehgal, and sculptor-drawer-photographer-writer David Shrigley. After much spirited debate among the general public, the winner will be announced, on Monday, December 2013. Boilerplate info about the Turner Prize: The Turner Prize award is £40,000 with £25,000 going to the winner and £5,000 each for the other shortlisted artists. The Prize, established in 1984, is awarded to a British artist under fifty for an outstanding exhibition or other presentation of their work in the twelve months preceding16 April 2013. It is intended to promote public discussion of new developments in contemporary British art and is widely recognised as one of the most important and prestigious awards for the visual arts in Europe.